Social media has become a volume play for most organizations. On Twitter, sales and marketing organizations are “broadcasting” in volumes their content to the world in attempts to bring prospects into the funnel. On LinkedIn, marketing organizations are broadcasting their content out and driving interest and awareness with sponsored updates and sponsored Inmails while sales pushes out volumes of templated messages. They’re trying to fill the top of the funnel and then let marketing automation take over – and this is happening with every social media network. By just pushing out messages and content on social media and then pushing out messaging with marketing automation, organizations are pushing away at least 60% of their available market! Below, you’ll see examples of what I mean. Now, although this article discusses the fact that marketing automation is not enough, I do understand the power of marketing automation and in staying top of mind. It is an integral part of a marketing program and it’s why I asked a colleague to research which marketing automation program I should upgrade to. Once my colleague viewed the company’s on-demand demo that was promoted through Tweets and sponsored updates on LinkedIn, we received generic marketing automation emails that pushed out benefits of using the Act On Software. Presenting benefits does not qualify as a compelling reason to break from status quo as explained inside this article on RepeatableSuccess.com . Benefits that are being touted by others do not build trust and demonstrate why I need to choose your solution over another. 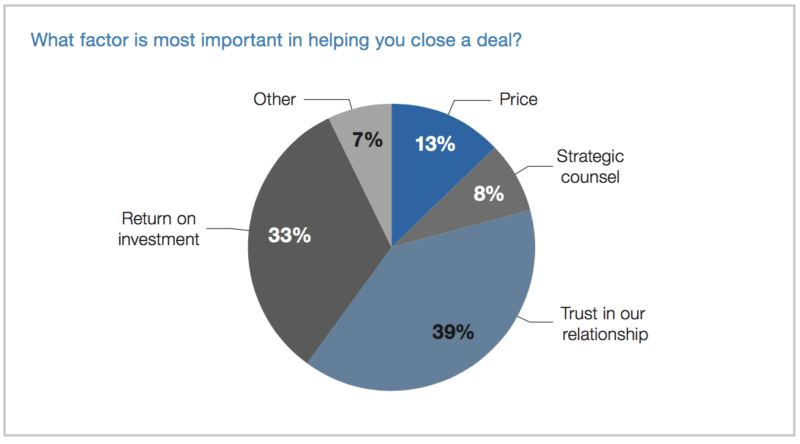 Recent studies show that trust in a relationship is paramount to ROI and all other deciding factors. A lead is an unqualified potential client. They respond to your LinkedIn ad, Inmail or sponsored content and opt-in to your webinar or white paper and more than 70% of these leads will consume more “free resources” and “free time” without any intention in buying. A prospect is a sales-qualified potential client. A lead becomes a prospect when sales and marketing person can identify a differentiated value proposition for an account. An opportunity is a self-qualified potential client. A prospect becomes an opportunity when the client lets loose their grip of the ‘status quo,’ and has become willing to have a conversation on how to close gaps. But you can only achieve this with personalized, relevant 1-on-1 communication and relationship building that can happen when you use LinkedIn for the full funnel. Lithium CMO, Kathy Keim, understands that marketers should spend less time on volume at the top of the funnel and more on what is driving through to a qualified sales opportunity. I totally agree with that but I don’t agree with how Lithium is driving prospects to a qualified sales opportunity. They’re letting marketing automation programs take over once they get a prospect into the funnel using updates. Lithium, which focuses on delivering an awesome digital experience to every customer, is just using LinkedIn for a top of the funnel tool instead of using LinkedIn to directly engage and interact with their prospects on a 1-on-1 more personal level to help grow relationships. They’re not thinking about the B2B buyers who are resistant to generic sales and marketing messages that are sent through automation programs – and those who want real relationships with experts as they make their decision. These are the people that are using social media (and LinkedIn specifically) throughout the complete buying process. 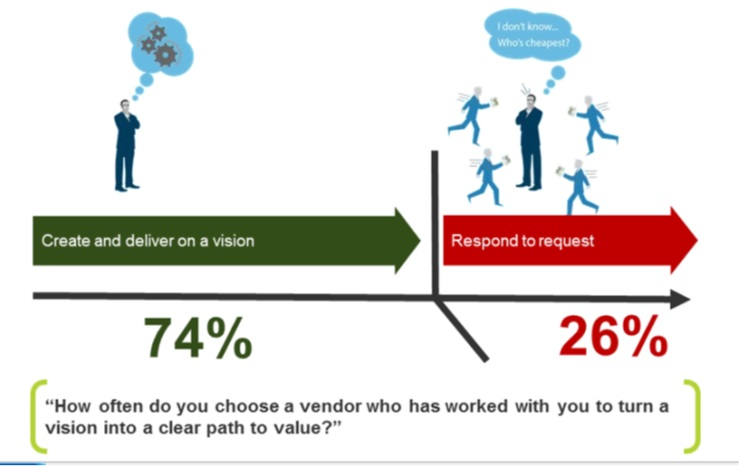 These buyers are looking for vendors that can turn a vision into a clear path to value. You can only do that if you take the time to build a real relationship instead of treating prospects like a lead – which is exactly what you’re doing when you let your marketing automation take over. Now, I’m not saying that you shouldn’t use marketing automation and your LinkedIn efforts – you absolutely should! But, sales and marketing should be simultaneously building relationships and qualifying leads by taking an account based marketing approach on LinkedIn once a prospect company is identified. Only by taking a personalized account based marketing approach can you reframe my thoughts, ideas and actions, provide me with a relevant story to connect to and show me a new path to the specific value I’m looking for. That’s how you’re going to create an appetite for change and drive demand for your solution vs. your competitor’s. More importantly, it’s going to give you access to a much larger market that is begging for you to build a relationship with them and give them a reason to change instead of pushing out generic sales and marketing messaging like everyone else.